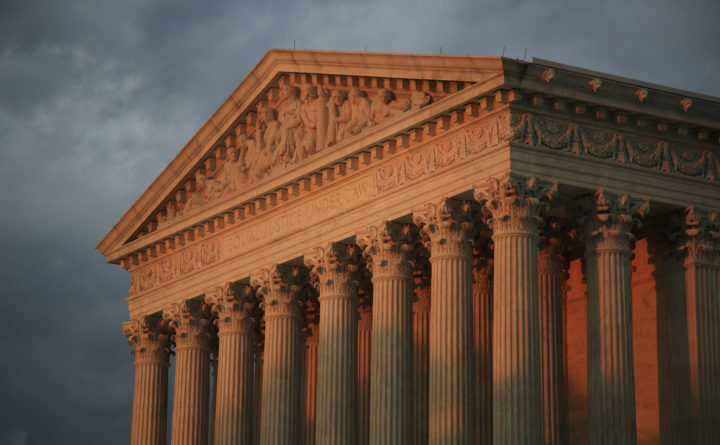 In this Oct. 4, 2018 photo, the U.S. Supreme Court is seen at sunset in Washington. WASHINGTON — The Supreme Court signaled Monday it is not anxious to revisit the abortion controversy in the year ahead, disappointing conservative activists who were cheered by the appointment of Justice Brett M. Kavanaugh. The court’s action leaves in place federal court rulings in much of the country that prevent states from denying Medicaid funds to women who go to a Planned Parenthood clinic for health care, including medical screenings or birth control. It is already illegal to use federal money like Medicaid to pay for abortions, but some states wanted to go further, cutting off all Medicaid funding to Planned Parenthood because the organization offers the procedure using alternative revenue sources. The lower courts are divided on the Medicaid funding dispute, making the high court’s refusal to clarify the issue all the more surprising to some. The court’s brief order denying the appeals from Louisiana and Kansas suggest Chief Justice John G. Roberts Jr. and Justice Brett M. Kavanaugh were not willing to hear the cases. Last year, the 8th Circuit Court in St. Louis, splitting with other appeals courts, upheld Arkansas’ decision to cut off funding to Medicaid to Planned Parenthood clinics. Lawyers for Louisiana and Kansas hoped that split would prompt the high court to take up the dispute. It takes four justices to hear a case, and these appeals were considered in a series of closed-door meetings since late September. But the court’s conservatives were unable to gain the needed fourth vote. Kavanaugh took his seat in the second week of October, and his supporters have assumed he would vote in favor of restricting abortion rights when given the opportunity. Catherine Foster, president of Americans United for Life, said her group was “disappointed” with the court’s action. “We join the dissent in calling on the court to do its duty,” she said. In the last decade, conservative states have sought to defund Planned Parenthood because it is the nation’s largest single provider of abortions. None of the Medicaid money pays for abortions, and most of these state funding bans have been blocked by federal judges. Medicaid is jointly funded by the federal government and the states, and Congress has said its funds may not be used to pay directly for abortions. But more than 2 million people go to Planned Parenthood clinics for birth control and general health care, including cancer screenings and pregnancy tests. And for low-income women, this health care can be paid for through Medicaid. Republican lawmakers who sponsored the “defund” laws argue the states should not indirectly subsidize facilities that perform abortions. But lawyers for Planned Parenthood and their patients have gone to federal courts and won rulings blocking most of these laws from taking effect. They have done so by relying on a provision in the Medicaid Act that says eligible patients may go to any doctor’s office, hospital or clinic that is “qualified to perform” the required medical services. If a federal law creates a right for individuals, plaintiffs like the Planned Parenthood patients may go to court and sue if that right is denied. But in their appeals, lawyers for Kansas, Louisiana and 13 other states argued that Medicaid is a health care spending agreement, not a law that establishes rights for individuals. If so, they said, states may decide who is a qualified provider of health care.